Thanks so much to Georgia-Rae @ ShutterPug for nominating me for this! I was actually nominated way back at the beginning of August, but because of being away haven’t seen it until just this week, so sorry for the delay! This award is shared with those bloggers in the community who we think are, well, lovely! There are so many of you out there, so EVERYONE should get this award! Tell your nominees they’ve been nominated for one lovely award. I’ve just got back from singing on a ship for 6 weeks! I had a cold in the penultimate week of said crusade, which has left me with a cough that I’ll probably have for another 2 weeks at least… such is my immune system. When I’m not singing I work in a bookshop in London. It’s a dream. I studied Musical Theatre at a top drama school for 3 years and lived to tell the tale! Velaris is currently my favourite fictional place, up there next to Hogwarts, obviously. I have one of the SCC Luna Lovegood with glasses Funko’s on it’s way to me in the post AND I’M SERIOUSLY NERD EXCITED!!! See if you guys fare any better! Sorry if you’ve already been tagged, don’t feel like you have to do it again! Feel free to leave your post links below though so I can check them out. Synopsis: Kate Harker is a girl who isn’t afraid of the dark. She’s a girl who hunts monsters. And she’s good at it. August Flynn is a monster who can never be human, no matter how much he once yearned for it. He’s a monster with a part to play. 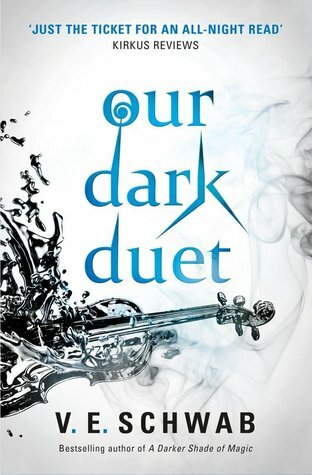 And he will play it, no matter the cost.Nearly six months after Kate and August were first thrown together, the war between the monsters and the humans is terrifying reality. In Verity, August has become the leader he never wished to be, and in Prosperity, Kate has become the ruthless hunter she knew she could be. When a new monster emerges from the shadows—one who feeds on chaos and brings out its victim’s inner demons—it lures Kate home, where she finds more than she bargained for. She’ll face a monster she thought she killed, a boy she thought she knew, and a demon all her own. This was SO good. Like, SOOOO GOOD. I devoured This Savage Song (see my review here), and the same went for the sequel. Needless to say the review didn’t come “tomorrow”, nor the day after, or the day after that… I guess I’ll never be emotionally stable enough to process the trauma that this book put me through! And I can’t really say much else about it because of my serious no spoiler policy. You just have to take my word for it when I say that you NEED to read this. If you love Schwab already from A Darker Shade of Magic, great, but read this. If you haven’t read any of her stuff before, READ THIS. Schwab’s writing just goes from strength to strength, and everything of hers that I read just seems to get better and better! Is there any stopping this woman? I’m sad that there will be no more to read of August and Kate. That ending just ripped my heart out and let’s just say, thank god I was at home when I read it. The Monsters of Verity has officially become my favourite duology. For those of you who have read it, feel free to message me on twitter or otherwise, and I will happily waffle about this book with you, spoilers and all! I apologise for my absence over the past 2 months; I’ve been performing on a ship doing pantomime and solo signing. But I’m back! Wooooo! I had a great time and made wonderful memories, but boy am I glad to be back! I’ve missed this lovely book community. So, I want to say first off, that I had planned for some blog posts to go live whilst I was away, however, silly me forgot to schedule them… so sorry if it seemed as though I had literally fallen off the face of the earth! Becuase of this, my reviews for books that I read before I went away will be going up over the course of this week. I also feel like I’ve missed out on so many great new releases, so please shout out some awesome books that I simply MUST read down in the comments below, because I seriously hate to miss out! I’m so happy to be back, and guess what guys..? It’s Christmas soon! Back to books… What have I been reading whilst I’ve been away? In all honesty, I’ve been in a bit of a slump until just recently, and haven’t read much at all over the past couple of months in comparison to what I had wanted to. Let me know what you guys have been reading, I’d love to know!